Janet Laurence creates art for gallery exhibition as well as site-specific public sculpture and installations. Common links between these different manifestations of her practice include a regard for the history of particular locations, an exploration of natural and built environments, and importantly a sense of how memory informs our experience of place. In all her work there is a strong awareness of the interplay of space and light as well as an interest in potentially transformative scientific and alchemical substances and processes. 'In stance of memory' has layered panels of photographic images, poured chemical substances and clouded reflective surfaces. The images are of a courtyard at the Jewish Museum Berlin. This courtyard has an expressive purpose as visitors emerge into an outdoor space in which trees grow out of the top of concrete columns. The trees and skies symbolise nature and life, and yet they are out of reach while the columns are claustrophobic and enclosing. The layered haunting images evoke memory and tragedy while the alchemical pours of substances and fluids suggest natural and unnatural materials and events, adding to a sense of being immersed in and estranged from the work at once. The veiling and revealing suggests processes of remembering and forgetting which touch on devastating personal experience and political events. 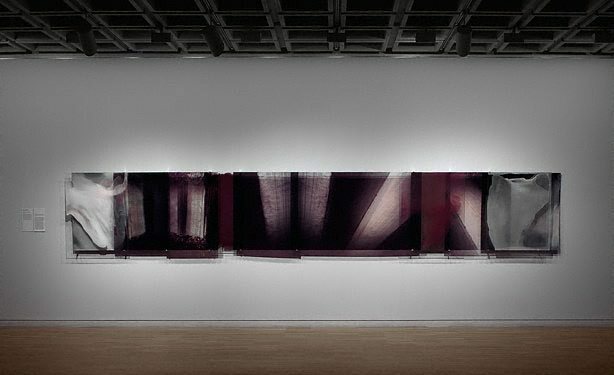 Janet Laurence: a survey exhibition , 2005, 20 (colour illus. ).